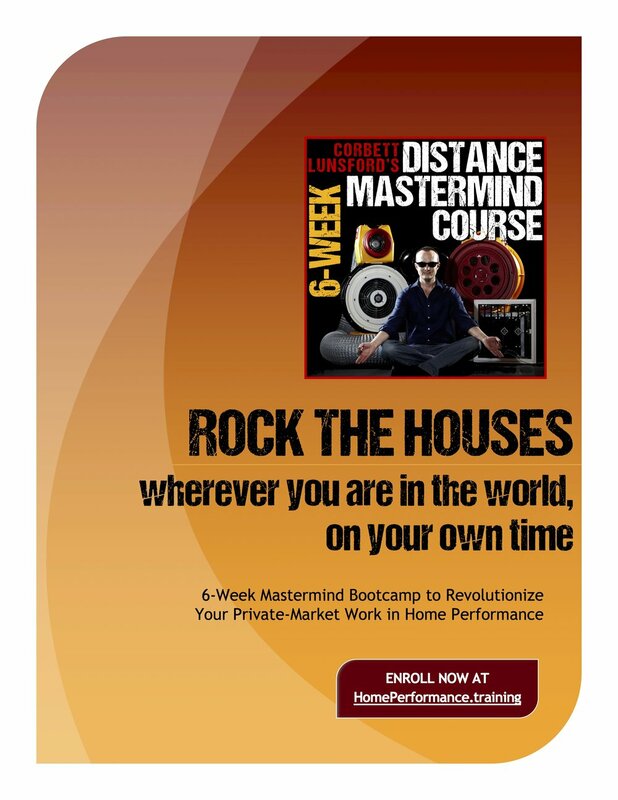 Corbett Lunsford's 6-Week Mastermind Distance Course is the most intensive advanced course for home performance professionals. In six weeks from the comfort of your own hometown, learn and implement techniques to use performance metrics to earn more money doing better work for happier clients in the free market. Go beyond BPI, HERS and NATE certification, and beyond energy efficiency! 6-Week Bootcamp RevolutionizeS HOW YOUR Company Uses Performance METRICS. PARTICIPATE ON YOUR SCHEDULE, FROM YOUR HOMETOWN WITH OTHER PROS AROUND THE WORLD.